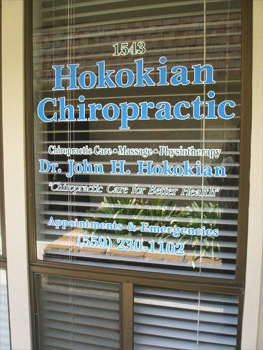 Dr. Hokokian is a doctor of chiropractics. He offers chiropractic care for those who have neck pain, back pain, shoulder pain, and headaches. Some seek treatment alternatives following automobile accidents, work related injuries, or sports injuries. He also treats Medicare (senior) patients. Some choose his care for stiffness or loss of motion whereas others seek wellness care and exercise instruction. Our office provides chiropractic manipulation along with various forms of physiotherapy such as: ultrasound, electrical muscle stimulation, ice packs hydrocolator (hot) packs, vibration, diathermy (deep heat), and massage. Dr. Hokokian uses various treatment techniques: Gonstead, Diversified, Thompson Drop, Activator, acupressure and flexion-distraction. He is certified to provide Manipulation Under Anesthesia (M.U.A.) for patients with chronic pain and stiffness that are unable to receive traditional chiropractic care in his office. Patients that come in for care have neuro-musculo-skeletal conditions, or more simply, conditions that involve the nerves, muscles and skeletal (bones/joints) system. Dr. Hokokian has over two decades of experience treating family members with conditions such as: headaches, neck pain, back pain, shoulder pain, extremity tingling and numbness, along with stiffness due to aging. He completed an extensive Certified Chiropractic Sports Practitioner postgraduate training program. This has enabled him to treat various types of sports injuries with success. He has completed an extensive postgraduate education program in Whiplash and Brain Injury Traumatology during 2013-2014. This training has been beneficial in the diagnosis and treatment in those that have been involved in car and other motor vehicle collisions/accidents. He has completed several postgraduate courses related to treating various types of cases. These courses have aided him and his staff to stay current and treat their patients with thorough care.